December has always been the month where the 47 Ronin enter the stream of modern Japanese consciousness. 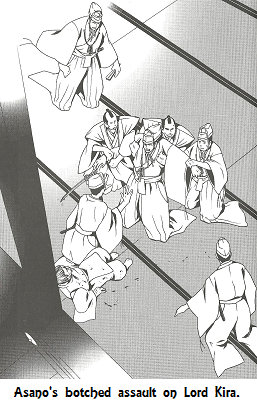 The assault by the Ronin on Lord Kira’s estate took place on the “fourteenth day of the twelfth month” in the year of Genroku 15. While this actually corresponds to January 30th of the Western calendar, the Japanese have traditionally recognized it on December 14th. The Ronin appear in commercials, special events and observances are held at Sengakuji Temple (where the Ronin’s graves are located), and the airwaves tend to screen a goodly number of the dozens of TV shows and movies that have depicted the event over the decades. And this year, the Ronin will be making their presence felt in December in the West. Most obvious is the big-budget fantasy film “47 Ronin” starring Keanu Reeves that will be making its US debut Christmas day. Filled with CGI monsters and having little to do with the real 47 Ronin, it remains to be seen how the movie going public will react to it. But Shambhala Publications has also recently released a graphic novel version of the traditional 47 Ronin tale, just in time to join the festivities. The team of writer Sean Michael Wilson and artist Shimojima Akiko (along with letterer Ben Dickson) have combined to put together an adaptation of Chushingura (roughly ‘treasury of loyal retainers’, the fictional account of the historical incident that has been the subject of hundreds of kabuki plays, puppet plays, films, manga, novels, and artwork over the centuries) that exceeds anything yet done in the West (including the recent failed Dark Horse adaptation). It’s a solid adaptation that faithfully brings out the story’s many facets, perfectly complimented by accurate, simple, and clean artwork. -Chushingura contains many fictional characters, such as Kamei and ‘Urata from Satsuma’ AKA the Satsuma man. -it also contains many fictional incidents-for example, after the assault, the Ronin pass through the streets of Edo stopping to be praised and feted by the populace. 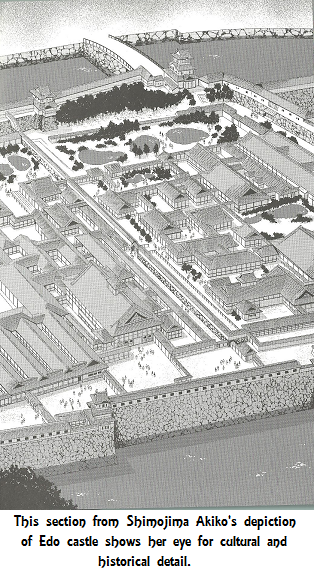 They actually moved expeditiously to their final goal of Sengakuji Temple as they feared an assault by the Uesugi and certainly weren't being embraced by the townspeople. -Asano is shown in Chushingura as the embodiment of samurai values and virtue, whereas in real life he was a drunken womanizer with no skills to speak of (as we like to say, the 'Brick McBurly of his day'). -Oishi (the leader of the Ronin) is depicted as a loyal and brilliant retainer, but was also a man of few skills aside from drinking and procuring women for Asano. -Kira Yoshihisa (often referred to as ‘Yoshinaka’) is shown as a grasping, greedy villain but there is no historical evidence to support it. He was more of a typical bakufu bureaucrat. -Asano Naganori’s assault is provoked by Kira’s greed and rudeness, but the truth is that no one has a clue why he did it. -the Ronin are shown in Chushingura to be taking great care to take no innocent lives, but during the assault they slaughtered many of Kira’s household staff. Author Sean Michael Wilson sticks closely to the traditional accounts, not embellishing the Ronin with further exploits or fawning hero worship. This being the case, Kira is the villain, Asano a victim, and the Ronin are the true heroes of the story. Unlike many Western authors, however, Wilson doesn’t omit some of the darker threads of the old legends that are often dropped. One of these is Oishi’s implied criticism of Asano-“I hope I can be allowed to express some doubt as to the wisdom of our Lord’s actions. But it is done now and we must act well. If the Shogun will allow Asano Daigaku to become the new Lord, then we can continue the house with honor”. This short discourse brings an entirely new dimension to the Ronin’s vendetta, and is further embellished by Wilson presenting it as a conversation between the two factions of the Ako Ronin. In a little over two pages, much is explained. The feuding factions of the Ronin (the radicals led by Horibe Yasubei who wanted to kill Kira at once and Oishi’s moderates who only wanted the Asano family to remain in control of Ako) that almost resulted in the assault being called off, the waiting period of a year between Asano’s suicide and the raid (not because the Ronin were trying to lull Kira’s suspicions, but because they were waiting on the Shogun’s decision), the question of whether the Ronin were truly loyal to Asano Naganori or just to their positions within the house of Asano-they’re set up effortlessly and subtly. The Ronin’s callous manipulation of women and employers, and the cruelty of Oishi’s rejection of his wife and family (albeit for a good reason) are shown for all to see. By not editing these incidents from the proceedings, Wilson manages to turn the Ronin from cardboard heroes into human beings with realistic motivations and feelings. It’s also closer to real history, as most historians believe the Ronin acted to preserve their individual honor rather than out of any loyalty to Asano (who the majority had never even met). Even some of Kira’s retainers are allowed their moment to shine, with a small group of three holding back the Ronin. Also given time to develop is the friendship between ‘Kamei-sama’ and Asano. Traditionally, Kamei is shown as the real hothead of the pair and is only saved from Asano’s fate by the quick thinking of two of his retainers (behind Kamei’s back, they bribe Kira, ending his verbal abuse of Kamei). Wilson depicts Asano’s efforts to connect with Kamei in an effort to keep him from assaulting their teacher. The friendship between the two daimyo again helps to make them believable, and as Kira turns the full of his scorn on Asano, it makes Asano’s transition from the voice of reason to unbridled rage all the more shocking and unexpected. Combined with the graphic portrayal of his seppuku (ritual suicide), it makes him a far more sympathetic character. This Asano is not perfect, but one can understand his frustration, confusion, and anger. Many works dealing with the 47 Ronin tend to be bloodless affairs, concentrating on the ‘glory’ of the assault and glossing over the violence that was a part of it. Kira’s murder and Asano’s seppuku usually take place ‘off-screen’ or are not described in anything but the most general terms. Not so here. They’re depicted in all their ugliness, giving this version of the story a more visceral impact that tends to rip away more of the fairy tale aspect of the story and make it much more realistic. When stripped to its essentials, the tale of the Ronin is nothing more than the tragic retaliatory murder of a largely blameless old man (described by historian James McMullen as an '...atavistic, violent, and futile incident' involving '...reductive morality and brittle sense of honor that sanctioned such pointless sacrifice'), and nothing brings this home more than Oishi’s beheading of Kira. For the most part the tale flows smoothly from one incident to another, although there is a bit of a rough transition from a scene between Kira and Asano to Asano’s later assault on Kira in Edo castle. It comes across as one incident, although the costuming and situation soon make it obvious such is not the case. Chushingura is a LONG story-kabuki plays can take days, movies several hours. Compressing everything into 150 pages or so is not an easy job, but Wilson manages to include all of the high points along with many of the sub-plots (most famously the ‘side jobs’ of the Ronin in Edo as they spy on Kira in the guise of workmen and merchants) without making things seem rushed. Dialogue takes the proper tone-a rather old-fashioned and formal way of speaking that reflects as best as it can in English the tone that a samurai would be employing in everyday speech. Artist Shimojima Akiko’s black and white artwork is a breath of fresh air, showing an excellent level of accurate cultural and historical detail that was lacking in the Dark Horse version of the Ronin. In our opinion, it’s also far more suited to this serious story than the more whimsical and cartoonish artwork featured in the Dark Horse effort. 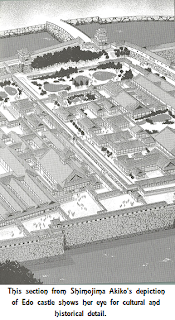 Her double splash page spread of Edo Castle (home of the Shogun and the setting for Asano’s assault) is a perfect example, showing a grasp of Edo period Japanese architecture and castle layout that evades most artists in the West (many of whom seemingly take their cues from Chinese Wuxia films). It gives the story an authentic air that helps the reader to immerse themselves in the story rather than distract them. As well as technical ability, she also displays a subtle touch, such as several illustrations of a spider in its web slowly being revealed as being over Asano’s shoulder-a nice bit of symbolism. The simple look of heartfelt hurt on the face of Oishi’s young daughter as he disowns her is heartbreaking. While Shimojima’s depiction of the Ronin’s assault on Kira’s mansion is done in the best frenetic manga style, there are quiet moments interspaced-such as when Kira’s chief retainer is struck down and his essence slowly drifts into the sky. For him, this battle is over and no longer matters. It imparts the sense of the transitory and impermanent nature of things inherent in Buddhism. Interestingly, this concept is stood on its head in the final scene, where the dying body of the Satsuma Man fades away to show a modern family paying homage to the Ronin’s graves at Sengakuji. While the body might pass on, the legend continues to live in perpetuity. Shimojima also does her best to make the individual characters identifiable. The Shogun’s court stressed conformity and standardization (one reason Asano needed instruction in the highly intricate and detailed sphere of court etiquette). Hairstyles were also tightly regulated. This means that everyone had a rather generic look. Shimojima manages within this context to give cues to the reader-the differing crests on the formal kataginu, small differences in hairstyles, the shading and patterns of clothes, even things as subtle as eyebrow thickness all help in picking out the key players. It also rewards sharp-eyed readers who can spot characters from earlier in the story showing up later. One mild criticism of the book is that it would have benefited from a short text piece such as was included in Wilson’s two other graphic novels for Shambhala. Many cultural and historical issues that Western audiences might find confusing could have been explained here, such as why Asano became homicidal when asked to tie the ribbon on Kira’s sock or why Oishi would have been so brutal in dealing with his wife (casting her out meant his family would not be held responsible for his actions and punished). Why do all in the samurai in the castle have ‘pants’ on that are twice as long as their legs (this was used to keep them from moving quickly and designed to forestall possible assassination attempts on the Shogun)? It also could have been used to give more background on the historical incident. 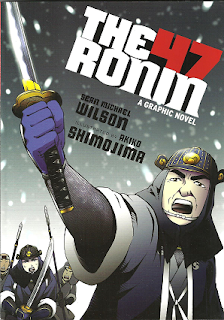 So if you’re looking for an adaptation of the Chushingura legend that sticks to the story and doesn’t include fantasy monsters, witches, giants, or gaijin actors shoehorned into the tale, you won’t find a better executed one than Wilson’s and Shimojima’s “The 47 Ronin”. It’s an adaptation that manages to infuse both the Ronin and their foes with humanity. Author Wilson makes you feel Asano’s outrage, Kira’s panic, the conflicting views of Asano’s retainers, and the excitement of the raid. Artist Shimojima gives us a period-accurate Japan laced with dynamic action and quiet moments in turn. They’ve taken what is often depicted as a morality tale filled with two dimensional characters and given it depth and texture. During this season of the Ronin, ‘tis the book ye be looking for. The 47 Ronin is available directly from Shambhala or from Amazon. All artwork courtesy and copyright 2103 Shambhala Publications. It may not be reproduced, in any form or by any means, electronic or mechanical, including photocopying, recording, or by any information storage and retrieval system, without permission in writing from the publisher. THIS is a really impressive analysis, by far the most indepth, intelligent and fair (about both the books good and bad points). You note a few mistakes we made (accurately, I admit). A short text piece, as with the other books, would have been better, yes. And that some of the characters and scenes are fictionalised, indeed. As to how the book is described: it is an unfortunate, but apparently neccesary habit, that marketing type blurbs often simplize things too much. Actually, it is not correct to say that our version is the REAL events of the 47 ronin, I quite agree. It would be better to pitch it as saying that ours attempts to be CLOSER to the historical record, as far as research can establish that, than the other more recent versions. A more modest but more accurate claim. So, I'm pleased to note you see many good points in our book and conclude that our version is indeed the best of the recent versions. To get that from a group that REALLY knows Japanese history and samurai well feels like a nice stamp of approval. We will make more efforts on future books to reduce the mistakes and keep the authenticity high. Coming next from us, over the following two years, is a graphic novel version of the full life of Miyamoto Musashi; a version of the 9thC Chinese 'Cold Mountain Poems'; a look at the techniques of the Shinobi ninja; and an illustrated version of some Japanese Ghost Stories collected in the late 19thC by Lafcadio Hearn. Thanks for your thoughts on the review. The marketing is correct insofar as the GN IS the most accurate version of Chushingura available in English! Dark Horse's version added even more ridiculous misconduct on Kira's part, wildly exaggerated everything, and topped it off with a massive dose of unbridled hero worship. Your version, in the best Japanese tradition, presents the story 'warts and all'. On our part, we've really enjoyed the GN line and the care and attention to detail you and the illustrators have put into them. It's great to see someone that cares enough about the stories to do the research and work to give them a proper presentation and preserve what the original authors were trying to get across. All too often (especially in the 'comics'/graphic novel medium) Western authors and artists substitute Chinese culture for Japanese, making them into comics version of Shaw brothers movies. I see on Amazon.jp that there's a version of your 47 Ronin GN in Japanese (using a different artist) that I just ordered. it'll be interesting to compare it to the the English version. The new books you're working on look interesting, particularly Hearn's ghost stories. Hopefully in your work on Musashi you'll be including his WHOLE life, including the less-than-glowing parts that often get left out of most Western books (like his part in suppressing a peasant rebellion, and his consequent defeat at the hands of an untrained peasant armed with a rock). Presenting the whole story gives these historical figures their humanity back and makes them three dimensional. We're looking forward to seeing the new books and best of luck!